My Bonnie Hunter Mystery quilt is now a flimsy. I really enjoy making a quilt this way with all the pieces sewn first and then made into blocks. I know how bored I can get making block after block. 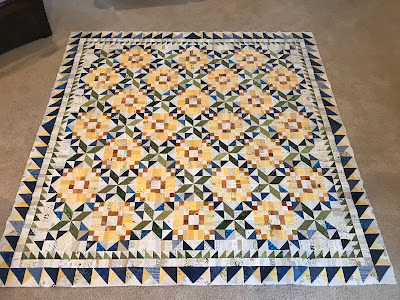 I've never been a fan of applying borders, but these were the biggest nightmare of my quilt. I sewed my blue and neutral border on and then three of the green HST borders. The green was on upside down, but I was fine with that. I actually liked the corners better. BUT......when I got to the last border, I realized that my blue borders were on wrong. Rip, rip, rip. Green borders off. More rip, rip, rip. Three blue borders off. What's that? Only one blue border was wrong? Of course it was the one that I hadn't ripped off yet. Sheesh. How stupid can I be? I was especially glad that I had shortened my stitch length for all those borders!! NOT. I finally stepped away from the machine for the day. The next day I was right back where I started the day before. In the end the borders all fit on well, even after all of the handling. This was when I threw it down in a heap after realizing that un-sewing would be required. To add insult to injury, as they say, I also got my finger a bit too involved in my stitching and broke off my needle threader on my sewing machine. I'll have to go back to the aiming game until I can get a new one. Throughout the whole ordeal, my sister (IG alaskanquilter) and I were texting with each other. She is also doing the Good Fortune quilt. Her version is very elegant looking in teals and reds. It was especially nice to have a sympathetic ear during my trials. I'm sure she saved this from becoming an UFO. I'm still contemplating adding 6" neutral strip blocks for a final border to make it a bit larger. It would bring it up to 84" square. It was another great pattern from Bonnie. We've had such dark and rainy days for the last few weeks so the pictures outside will have to wait. Be sure to check back on the 21st to see my Black and White project that I stitched up for the Black and White Blog Hop hosted by Carla at Creatin in the Sticks. Even with the trials of your borders, your quilt is beautiful. I so much more like the yellows over the orange. Well done! 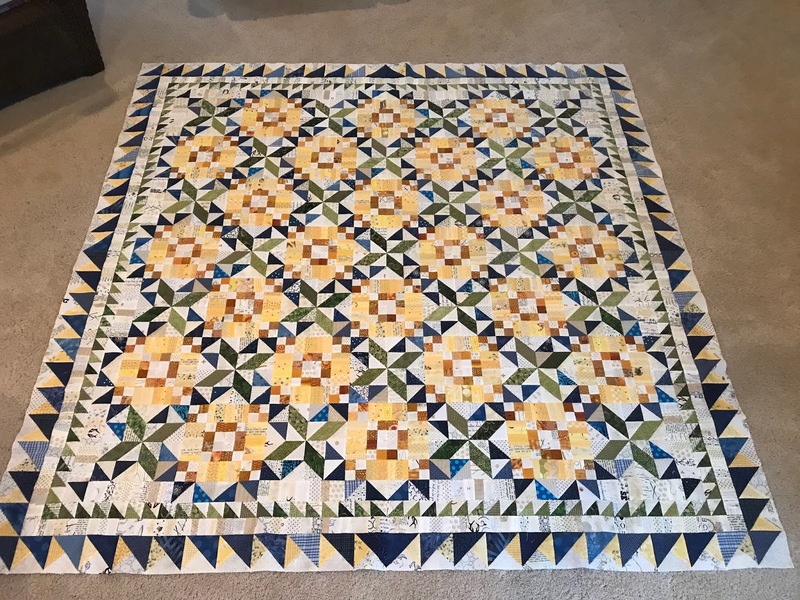 Your perseverance paid off....your quilt is gorgeous. Quilting can be very humbling for sure! Looking forward to seeing your black and white quilt! Absolutely gorgeous. I love your fabrics. And, I'm so proud of you for your perseverance. This is going to be a treasure for many years to come. Haha! Mine is STILL in a heap on the floor. It may stay there for a while. So glad you finished yours. It’s beautiful! Your Good Fortune flimsy looks beautiful and I'm sorry you had some challenges with it. Aren't you happy that you hung in there though? Sorry to hear about your problems, we've all been there! You're quilt top is beautiful! Oh, I can feel your pain with those borders, but your top is absolutely gorgeous. I wonder if anyone but you would have even noticed that the borders had gone on 'wrong'. You aren't the only one I've read about having the same issue with the borders. Wish I had the patience to do one of Bonnie's mysteries. Oh gosh, all that ripping out of teeny tiny stitches...ouch!! But you know what, your Bonny Hunter Mystery flimsy is a masterpiece. I do believe you are the queen of piecing. I am in awe!! Love all that colour and pattern. Rip-it is my middle name. After all that trouble, your quilt looks fantastic!!!! I read a couple other blogs that had their borders on wrong and like you, found out after ripping they weren't all wrong, just some of them. I like your colors better than some of the others I have seen. I love pieced borders but I've said a few french words while making them. Glad your sister was there to keep you from tossing it, your quilt turned out beautiful! I love it and wish I had participated. You finished in great time too! Half way through those borders there was a risk I might put mine away and forget about it. And I didn't have them on the wrong way round. So I really admire your persistence with them. The end result is beautiful. So pretty. I had planned on doing Good Fortune, but did not. Yours is very pretty. Beautiful quilt and I love the colors you chose Mary! I know the pain of sewing borders and wrong and having to rip them out but it will be worth it in the end! Gorgeous quilt~even with all the Sturm und Drung that it tortured you with in the assembly. I can't believe you had to mess around with the borders that much--it's a cautionary tale for all of us who want to make this quilt. Yours turned out so beautifully! Congrats! Glad you didn't get hurt with that needle threader incident. I love the colors you used for your Good Fortune and even the border treatment you first pictured looked great to me. I know what you mean about the redundancy while working on blocks and sometimes the tediousness while working them. Oh your quilt turned out lovely. I can so relate. This top is just marvelous! Great job on it! I didn't do the QAL this time and have only seen a few pics of progress from different people, but recently I got bonnie's new book and have made one block from it. Oh No! It does happen though. I also walk away from the machine when that happens and come back to it the next day. Very happy to hear that your sister was there to lend a sympathetic ear. We all need that. Even with the border issues I really like it. Your color palette worked well together.